GoGreenSolar sells DIY solar kits to handy individuals or businesses who want to give solar energy a try. This company was founded in 2006 in California, and offers their kits to contractors, homeowners, small businesses, non-profit organizations, electricians, and other types of organizations or businesses that want to take advantage of the savings that solar energy offers. They’ve sold kits to the Department of Defense, the United States Marine Corps, the City of Los Angeles, and many other major buyers. Their parent company is Gigawatt Inc., which manufactures the solar panels that are sold in the kits. GoGreenSolar kits can also include the SunJack, a portable solar charger, and the SunPole, a solar-powered street lamp. GoGreenSolar is a direct seller that connects many different kinds of people to solar energy. They guarantee that their prices are the lowest, and will match prices on similar kits. They have technical support on standby, and offer information on financing options that can make the kits easier to afford. The financing options they can help with aren’t direct leasing programs through their company; rather, they can put a buyer in touch with the right lender or finance corporation. For example, they can help homeowners work with Admirals Bank to qualify for a home improvement loan. They take PayPal, meaning qualified users can use the “Bill Me Later” option to pay for their purchase in payments to PayPal. (They also take BitCoin, for tech-savvy buyers.) Additionally, there are two loan options that GoGreenSolar can help buyers – the Solar StepDown Loan and the SolarPlus Loan. Both of these options have hefty requirement lists, so they won’t be available to every buyer. The equipment that GoGreenSolar sells is custom packaged for your project. The company helps you choose exactly what you need in terms of panels, inverters, mounts, and other equipment, and then puts your kit together for you. There are ground mount kits as well as roof mount kits, and homeowners within the service area can also pay for optional installation services. However, there is no moving service, so if you decide to leave your home, you’ll have to move the panels yourself or leave them behind. The online monitoring system helps buyers see in real-time just how much solar energy their panels are capturing, and each package is drafted with your city or neighborhood’s exact codes and regulations in mind. GoGreenSolar will revise a package for free if the city rejects the proposal, until permit requirements can be satisfied. GoGreenSolar kits are one of the most affordable ways to install solar energy panels to a building or home. For buyers who are willing to do a little work, the GoGreenSolar kits may be one of the most affordable ways to install solar energy panels to a building or home. Even if you have to hire outside help to install the panels, the low prices of the kits and the other services offered by GoGreenSolar make this an excellent option for families or businesses that want to save money and do their part for the environment. 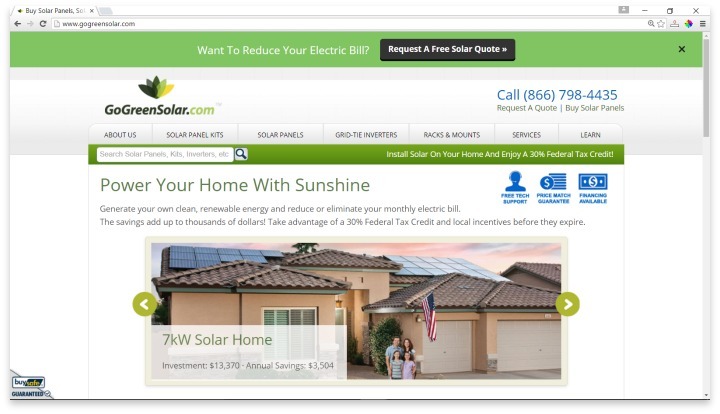 GoGreenSolar’s website is easy to navigate and offers plenty of information on their kits and how to go about getting a free estimate. Have you had an experience with this company? Please share your Avvo reviews below.